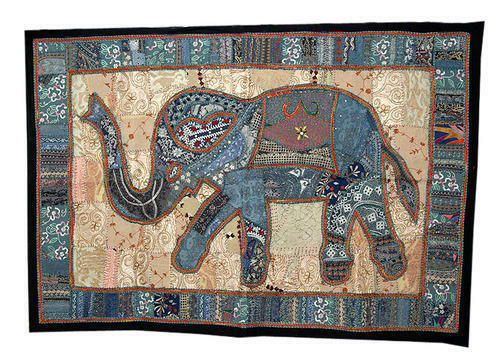 Elephant Wall Hanging India‎This Lot of 5 Pieces Wall Hangings will cost:$ 120. Superior quality of Vintage Wall Hangings available in 5,10,25,50 & 100 Pieces lots, best buy products for someone looking for Luxury Home Decor Products in wholesale. This is Beautiful & Gorgeous decorative Wall Hanging with very creative Patch work designs. This wall Hanging will really give attractive look to your Room & Office. You can see the graceful Heavy Embroidery, Sequins, Zari & Patch Work on it. It has an Elephant Patch also each & every patches are very unique & beautiful that it adds a totally new dimension to your home or hotel décor. It made Cotton & Vintage Mix Fabric very intricately sewed with Patches to give it a complete artistic piece on the wall. Our company is committed to manufacture, export and supply an exclusive array of uniquely designed Accessories, Garments, Handicrafts and Home Furnishing. Keeping in mind, the latest trends of the changing season, we design trendy skirts, chic dresses and elegant yet simple salwar suits. We also stock a wide range of handmade bags, lac jewelery, and innovative embroidered home furnishings. Our products are fabricated utilizing premium grade materials like Crepe, Georgette, Chiffon, Cotton, Silk, Lycra, Velvet and many more. We procure these materials from extremely reliable and registered vendors. With the assistance of our team of expert artisans, we design eye-catchy products and adorn them with beautiful beads, sequins and stones. Uniqueness in designs and patterns makes our products highly appreciated and demanding in the world market. We have our market presence in Australia, Africa, America and Europe.We are looking for Bulk query.